Phew…I cut it close on this one. I just made Jeffrey Alford and Naomi Duguid’s Oasis Naan a couple of hours ago. Luckily it’s a pretty simple bread dough, as long as you have the time to proof it. The recipe calls for making this flatbread dough by hand. I’m lazy…I used the food processor, same as I do for pizza dough. (I must say here, that I only made a half batch of dough, so everything fit just fine.) I started by adding the minimum amount of flour to my processor bowl, then with the machine running, I poured in my water/yeast combo. I added more flour to touch and turned off the machine for 10 minutes. Then I sprinkled the salt and a little bit more flour over the dough (because it still felt pretty sticky) and turned it back on for a few more seconds. I kneaded it on the counter for about a minute before putting into a bowl to proof. The dough bakes up nice and puffy (be sure to dock it well! ), and chewy, too. I topped mine with chopped spring garlic and za’atar spice, but I bet all kinds of things would be good on top. You could even make them like mini pizzas. It’s not quite as soft and charred as the naan I get from my local Indian takeaway, but I’d make this again for sure. We ate our naan with a freekeh, beet, chickpea and feta salad I concocted. Very healty…I think my husband thought the naan was the best part! For the recipe, see Baking with Julia by Dorie Greenspan or read Maggie’s Always Add More Butter and Phyl of Of Cabbages & King Cakes. There’s also a video of Alford, Duguid and Julia making the bread together, and the authors wrote this article that gives more naan tips. Don’t forget to check out the rest of the TWD Blogroll! great photo! it looks as though they turned out perfectly! I should have busted out my new food processor after all! These look lovely! I love you picture and how beautiful your naans are! This recipe is a winner for my family. Thanks for the advice about the food processor! Your naan looks great! My KA kneaded the dough for me. You´re naan is perfectly round! Looks yummy, no wonder your husband liked it so much. I also make bread in the food processor; it was such a discovery! Great photo! It is good enough to eat! 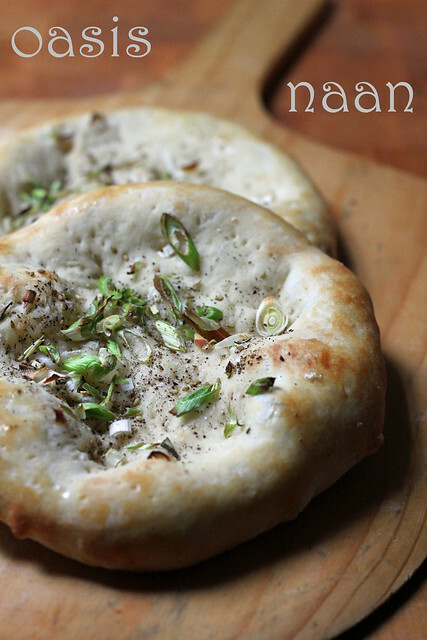 Your naan looks quite wonderful – very nice photo! Mmm, fresh garlic is a real treat. Such a great add-on for the naan! Your naan looks lovely…great photo! I really loved this bread, I’m sure I’ll be making it often in the future! You were under the gun to make this and STILL come up with a gorgeous shot…you’re amazing…Great lighting on this shot…I like where the shadows are on the bread…awesome (photo and bread). looks lovely, sounds delicious and I like your food processor method! Your naan looks so yummy! Nice job! Lovely photos. I bet your naan was outstanding. Great recipe. It was on my ‘baking bucket’ list. great BWJ recipe. Using the food processor was a good idea. Your naan looks beautiful! The garlic was a nice addition. I am naan-ed out for a bit and ready for a beautiful strawberry cake. Can’t wait to see yours as I know it will be lovely! Your naan is so lovely! I’m so jealous you have a baking peel! Delectable! Lovely photo as well. Not sure if you got my email, or if you’re just really busy right now, but I look forward to hearing from you whenever you get a chance! It’s funny for me to see a lot of these “Baking With Julia” recipes pop up, because I watched the accompanying series on PBS. I saw her make this naan with Jeffrey and Naomi, so it’s really neat to find it here on your blog. Yours looks delish, especially with the toppings! This bread dough looks simply delicious. Thank you for sharing the link to the recipe. This is honestly a erfect pastry. You can eat it as bread, you can make mini pizzas and you can meke it a dessert! Thanks for sharring! Btw the photo you posted with your naan bread looks stunning! I love Naan bread! I’ve never made it before but I’ll definitely have to try this recipe! Yum, thanks!